Is the future of humanity really more important than tenure? 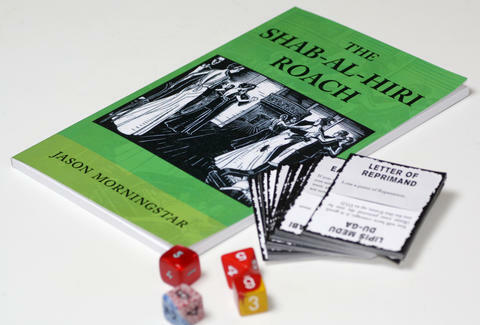 The Shab-Al-Hiri Roach is a role playing game in which you and your friends are professors at a small northeastern university in the early 20th century vying for recognition in a college town that's been beset by an ancient horror unleashed by an entomologist's recent trip to Egypt. This telepathic, soul-consuming roach might want to burn the world down, but in the interim it grants you power and influence while it toys with your mind, allowing you to win funding, talk your way into awards, and even talk your way out of murder. Set up is minimal with a few cards and a couple of dice, and the rules are simple enough that anyone can give it the old college try.